The NHS should switch to electric vehicles across its organisations, health officials have advised. 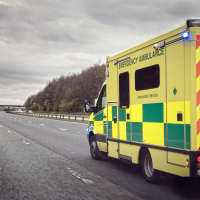 Drivers working for the NHS and local authorities should be encouraged to switch to electric or hybrid vehicles, and modify their driving style to reduce emissions. New draft guidance from the National Institute for Health and Care Excellence (Nice) says cutting emissions would tackle air pollution and improve public health, lessening the burden on the health service. The suggestions come days after new research found that there could be a link between air pollution and an increased risk of dementia. Air pollution from vans and cars costs the UK an estimated £5.9 billion a year, according to a report published in June by the University of Oxford and University of Bath. Around £0.9 billion of this may be attributed to health treatment costs from hospital admissions and the treatment of related illnesses, the researchers said. The draft guidance on air pollution, published by Nice, calls on public sector organisations to consider switching to low-emission cars, vans and lorries when replacing their fleets. Training drivers in techniques such as smooth acceleration and braking, not over-revving the engine, efficient gear changing and inflating tyres could also improve fuel efficiency and cut emissions, it said. The guidance also recommends that vulnerable people who attend health appointments when air pollution levels are particularly high are told how to deal with any symptoms they may experience. Professor Gillian Leng, deputy chief executive of NICE, said: "The public sector has a key role to play in reducing the emissions from its vehicle fleet. "Promoting an efficient driving style can not only reduce the amount of air pollutants from vehicles but also save money through reduced fuel consumption. "Organisations should make low vehicle emissions one of the key criteria when making routine procurement decisions. This could include selecting low-emission vehicles, including electric vehicles. "Lowering road-traffic-related air pollution will help reduce the significant financial costs currently incurred by the NHS through treating related illnesses." A consultation on the guidelines will close on October 8. If you're living with a serious medical condition and looking for travel insurance that meets your needs, check out our dedicated medical travel insurance options that cover a range of illness and conditions.